An online fax service, which operates as a virtual fax machine located accessed through the internet. A connected fax machine or multifunction printer (print/scan/copy/fax) that allows for faxing from the computer through the multifunction device attached to a land-line phone line. Through Windows 8 and 8.1’s bundled software “Windows Fax and Scan,” which turns your computer into a direct replacement of a hardcopy fax machine. Compared with Windows Fax and Scan (or a fax machine), an online fax service offers the ability to fax directly from the Internet without a dedicated phone line in your house, as well as access or manage fax communications from anywhere you can access the internet. For full details on online fax services compatible with Windows 8 and other operating systems, see our page on Online Faxing. Many connected fax and multifunction printer have the option to fax through the machine from the computer. While specific options depend on the fax machine’s manufacturer (and the software they offer), many units can send and receive faxes directly to the computer through the fax machine. Instead of having to print a document and then fax it (or receive a document over the fax then scan it), connecting a fax machine this way will let you send and receive faxes from the computer. When setting the system up, double check to see what happens with received faxes when the computer is not active. Some models will store a received fax in the fax/printer’s memory. The challenge with this approach is a power interruption will erase any stored faxes (that the fax machine has already marked as acknowledged). Windows 8 contains software already includes the ability to fax from your computer. The program is called “Windows Fax and Scan, ” and it’s packaged with the Windows 8 operating system. It’s important to be aware that to use Windows Fax and Scan to turn your computer into a fax machine, the computer needs always to be on and connected to the phone line to receive a fax. 1) Start the program through the start menu. 3) Select “Add” to have your fax modem installed. 4) Choose between Automatic or Manual Answering of the phone line. 5) Go to “Tools” and “Fax Settings” to configure additional options, including changing the automatic or manual reception, changing the number of rings before automatic pick up, configure TSID and CSID information, and automatically save or print a fax the moment it arrives. To use the Windows 8 Fax, you need to use the “Windows Fax and Scan” program. On the toolbar that appears in the program, select “New Fax” – if this is the first time that a fax is sending, you’ll be directed to the new fax wizard. This will allow you to set all the required settings to send a fax. To receive a fax from a Windows 8 Computer, you first need to set up the service in Windows Fax and Scan. If you want to have the manual option to answer with the fax service when the phone rings, you need first to have the Windows Fax and Scan program running. From the toolbar, select “Receive a Fax Now.” This will allow the computer to receive the fax when the phone rings. 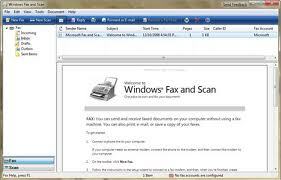 SevenForums.com – Windows 7 – Ways to Receive a Fax?